The North American pitcher plant is a master of deception. Beautiful pitcher-shaped traps are actually intricate natural adaptations to capture and digest insects in order to uptake minerals otherwise lacking in soil. 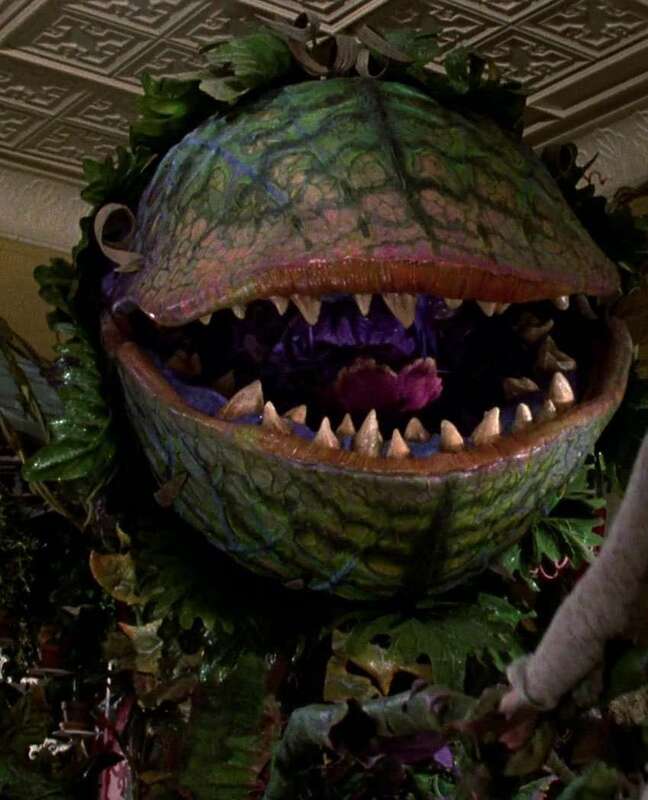 Through the use of several different luring and trapping tactics, the plant practically ensures that it will be well fed. 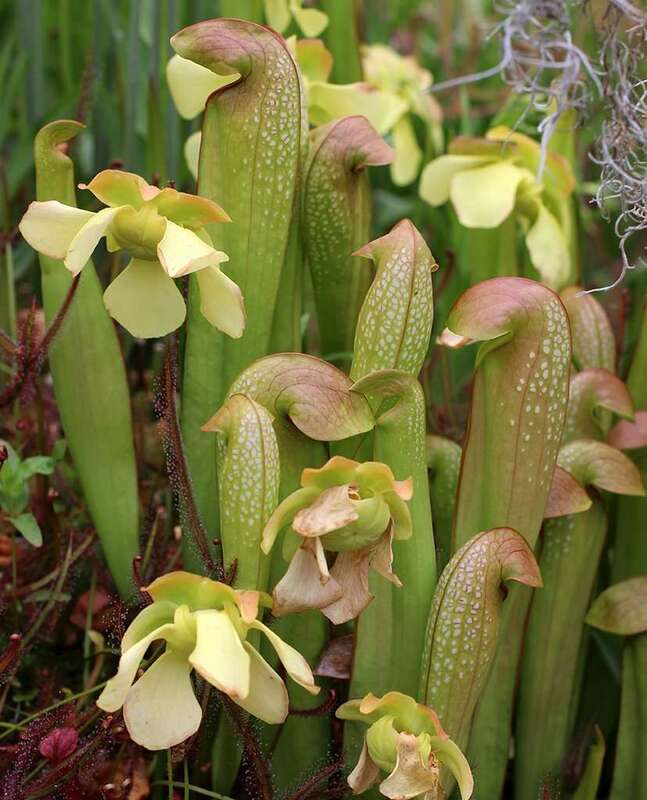 There are eight different species of Sarracenia – purple pitcher plants (Sarracenia purpurea), yellow trumpet plants (S. flava), sweet trumpets (S. rubra), pale trumpets (S. alata), white trumpets (S. leucophylla), mountain trumpets (S. oreophila), hooded pitcher plants (S. minor), and parrot pitcher plants (S. psittacina) – and hundreds of cultivars, variations, hybrids, and subspecies. 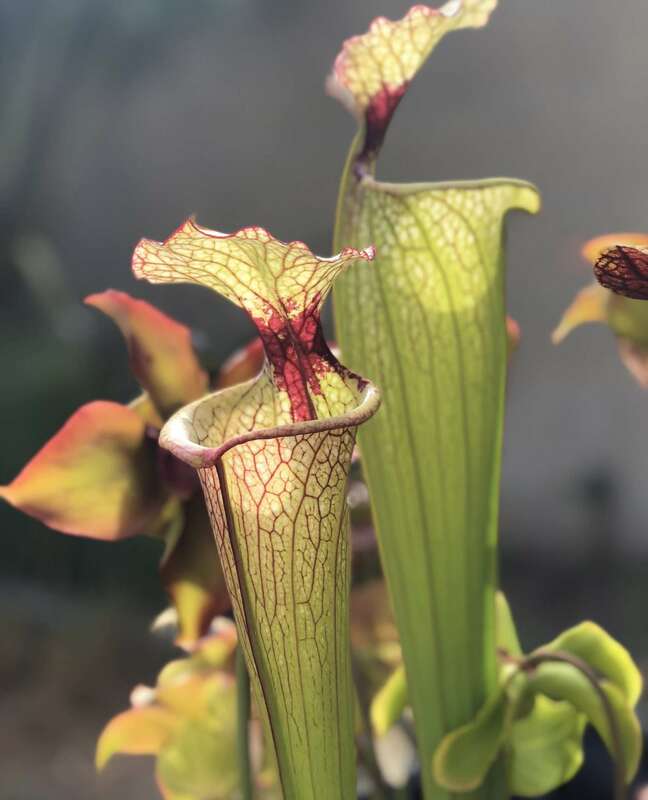 With so many different plants, the North American pitcher plant maintains a diverse variety of colors, shapes, and trapping mechanisms – making each plant a unique and beautiful addition to any carnivorous plant collection. 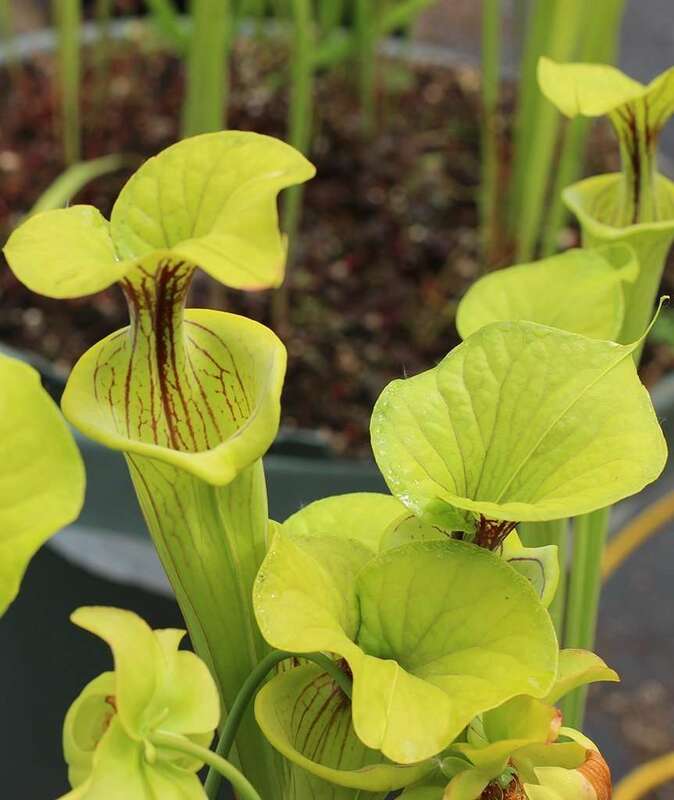 Most Sarracenia varieties produce beautiful and fascinating coloration to visually attract and direct insects towards the trap opening. These colors intensify in bright sun, and mostly appear as venation running up-and-down traps. Some species grow white or translucent windows imbedded on their hoods and traps to further disorient insects.Bugs near the trap mistake the clear window for an opening and they attempt to fly through it—big mistake. Luckily for us, when we accidentally walk into a clean glass door we just injure our pride, and perhaps our host will recommend that we start drinking water instead of punch. 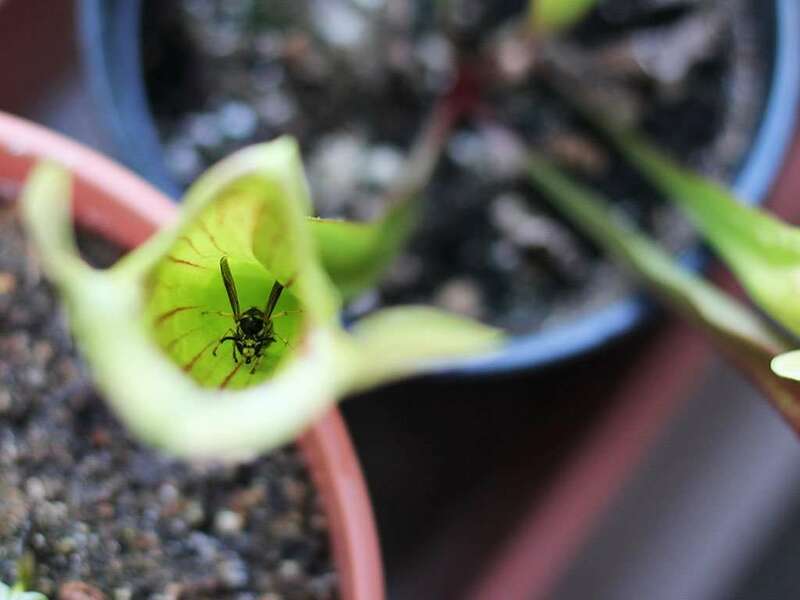 The bugs don’t have it so good; they collide with the window and fall down into the trap, where they are either drown in collected rainwater, or are dissolved by the pitcher plant’s digestive enzymes. The hood of the trap is a broad leaf-like protrusion that shades the opening of the trap and acts as a landing pad for flying insects. Under the hood, glands produce sweet smelling lure; conveniently, this is directly above the deadly mouth, so any bug attracted to this location is likely to fall right onto the dinner plate.Additional nectar trails are produced along the length of the pitcher, to attract crawling insects, and draw them up from the soil to the mouth.Pitcher plant nectar includes an intoxicating narcotic called coniine that causes paralysis and death in insects that drink too much of it. The physical effects on bugs make them more prone to drunkly stumbling into the mouth of the trap. Insects that find themselves on the hood of a North American pitcher plant trap are further directed towards the mouth by thin, sharp hairs that cover its underside. Bugs cannot easily move against the grain of the hairs because of their sharp tips, so they follow the grain, which leads right into the open mouth of the trap. The hairs themselves are also slick, so any insects trying to grasp them for a foothold will quickly lose their footing.About midway down some pitcher traps is a second round of downward-pointing hairs to prevent stranded bugs that have fallen in from crawling out. Sarracenia get their common name, pitcher plant, from the overall structure and trapping mechanism of these highly specialized leaves. In most species, the pitcher is narrow and cylindrical, tapering towards the soil and widening towards the hungry mouth. After falling in, flying insects can’t simply buzz out of these cylinders because the beating of their wings causes a vortex within the narrow space that makes flying impossible. Crawling insects find gripping on to the slick, convex surface inside the tube futile. With no way escape, they become lunch. 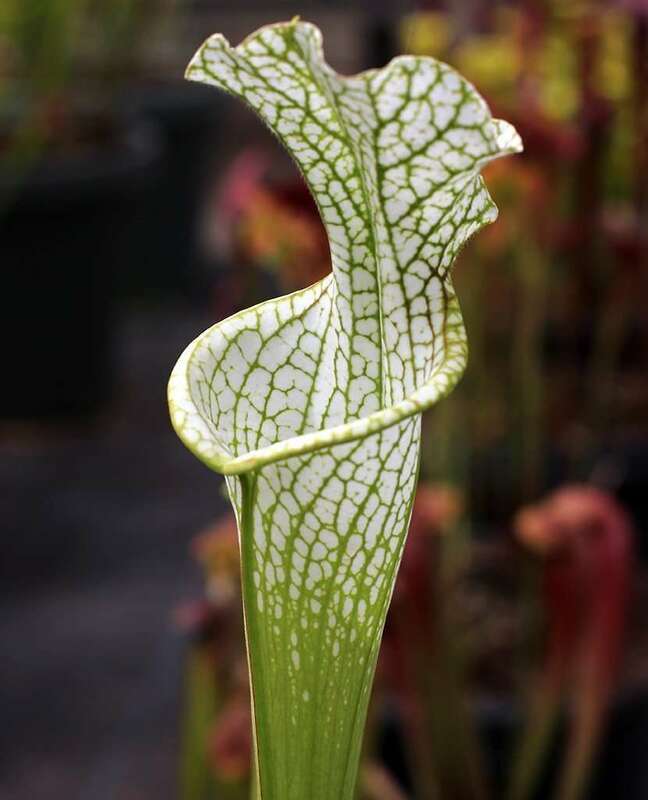 Note; the author has seen, on rare occasion, insect ingenuity – instead of climbing out of traps, desperate insects will chew a hole from inside the pitcher from which they can squeeze through to freedom.Some pitchers, like those on S. purpurea, eschew the tall, narrow tube for a squat, wide shape. This helps to collect rainwater that drowns prey and assists with digestion (see next section on digestion). Most North American pitcher plants secret digestive enzymes and acids that dissolve soft tissues of prey for absorption. Other species, like Sarracenia purpurea (the purple pitcher plant) collect rainwater in their traps. This water drowns prey and hosts bacteria that breaks down insects into a soup from which nitrogen, phosphorous, and potassium are absorbed. Sarracenia flourish in a generally acidic soil mixture (see below for recipe) that stays permanently damp to wet. Their root system branches off of a main rhizome that becomes woody as old growth dies back. 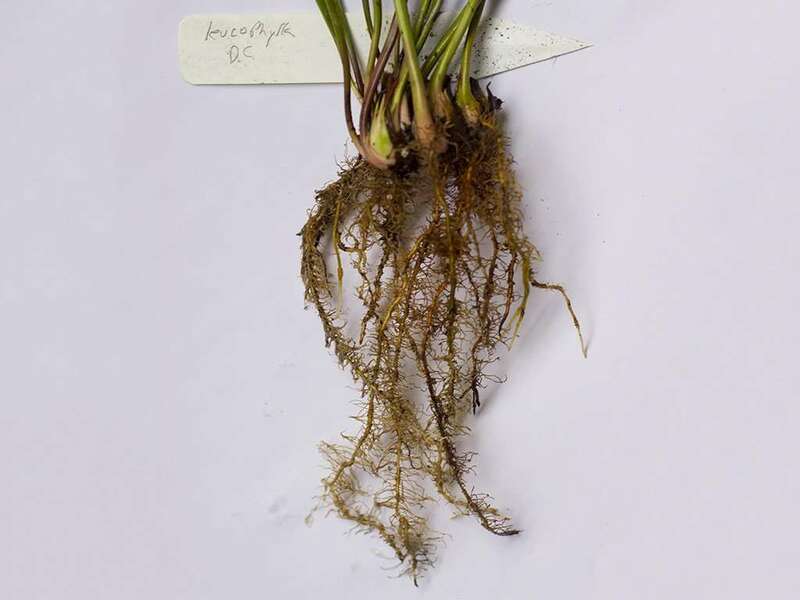 New growth points sprout off of this main rhizome, and can be divided from the parent plant as long as there are a few supporting roots attached. North American pitcher plants are warm temperate, enjoying warm summers and surviving brief freezes and light frosts during the winter. All require a three to four month winter dormancy. If grown outdoors, cooler temperatures and a shorter photoperiod will frequently trigger Sarracenia dormancy automatically, but greenhouse growing may require human intervention. 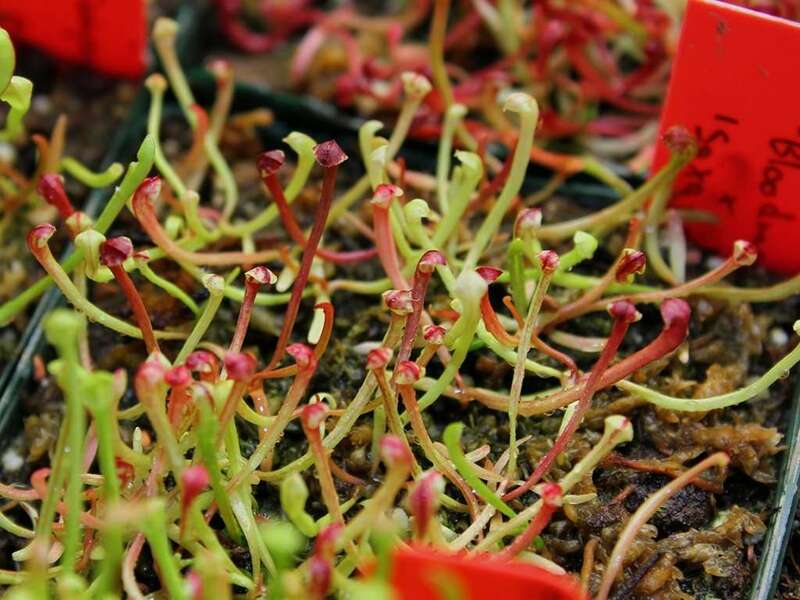 During dormancy, pitcher production stops, and existing pitchers on most species die back. Come late winter or early spring, the plants will rise-ome (see what I did there?) from their slumber and kick off seasonal pitcher production. 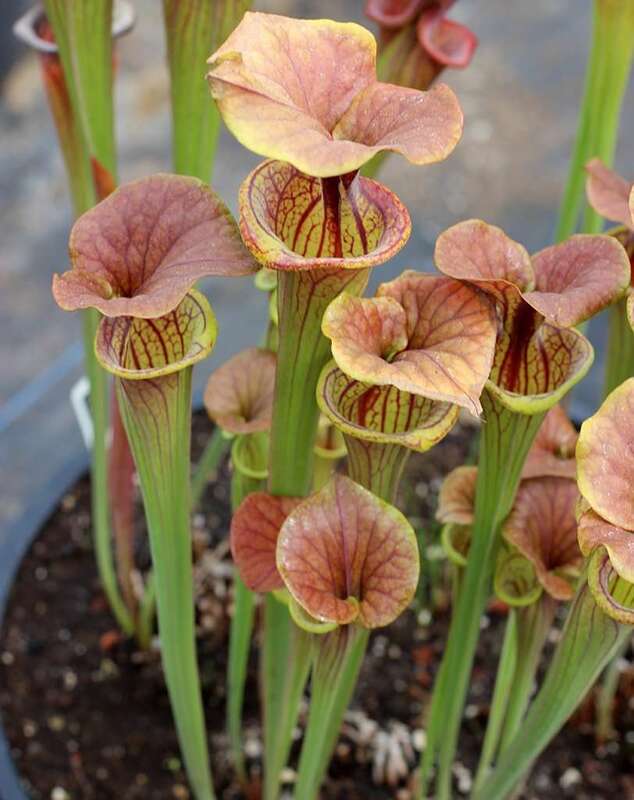 Some pitcher plants produce traps consistently throughout an entire growing season while others space out pitcher production into crops during spring, early summer, and late summer. Sarracenia flowers are in a beauty competition with the rest of the plant and rival showy orchids. But they’re not just beauty – they’re also brains. They’ve evolved a clever trick to promote cross pollination, and a healthier, more diverse gene pool. 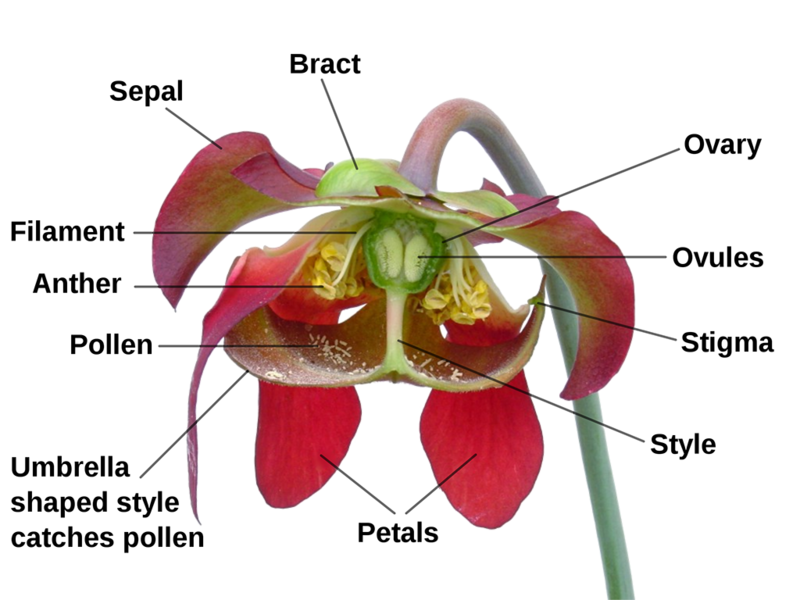 Bees will land on the sepal of the flower (see 2nd image, above), and crawl down to the stigma. The female stigma is the only entry point to reach the male stamens, and the pollen they produce. If those bees have already visited other Sarracenia flowers, as they crawl over the stigma, they transfer pollen to that plant. Once inside, bees take a pollen bath, and head to the next flower by squeezing under the flower petals and avoiding contact with the same stigmas – preventing self-pollination. Keep in mind that pitcher plants flower one time a year. They’ll send up flower stalks starting in late winter or early spring – often the first signs of life after a winter dormancy. When the flowers fully develop and open, petals will stick around for seven to ten days. 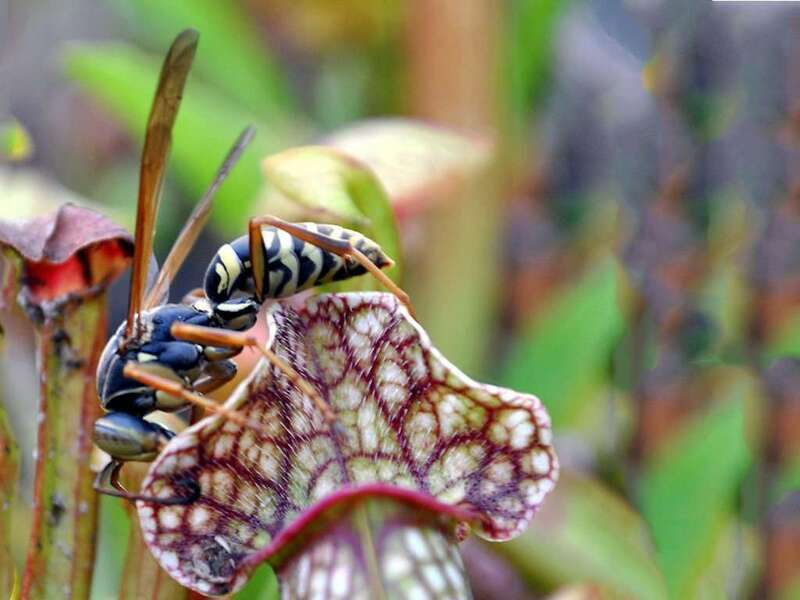 This is the period during which you can pollinate your Sarracenia. Lift a flower petal. See the male anthers hanging from the ceiling of the flower? These guys will release a powdery pollen onto the floor of the upside-down umbrella-looking style as soon as they’re ripe. Bees would normally bath in this, leave from under a petal, and move on to the stamen of the next plant. You’re going to mimic this by dabbing the pollen up with a small brush and painting it onto all five of the female stigmas. 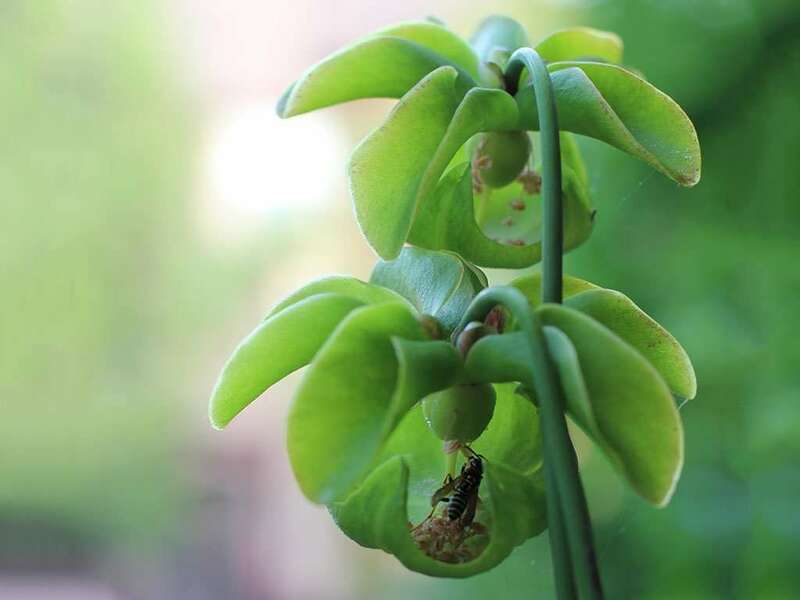 To find the stigmas, just look for the tiny hooks on the inside tips of the style.To create a hybrid pitcher plant, cross pollinate by taking the pollen from one plant and depositing it onto the stigma of another species or hybrid. Make sure to label your flowers otherwise you may forget which ones you hybridized. Tag the plants with something like S. flava x leucophylla where S. flava is the plant that has been pollinated with pollen from S. leucophylla.If you’d like to cross-pollinate flowers that open later in the season, you can store pollen for a few weeks in aluminum packets in the refrigerator. After about two weeks, or a successful pollination, petals and anthers fall off leaving behind the sepals, style, and the ovary. You’ll find the ovary on the ceiling of seedpod beneath where the anthers previously were. If pollinated, the ovary will swell as seed production begins. Over the coming months, the whole seedpod can tilt upward slightly. 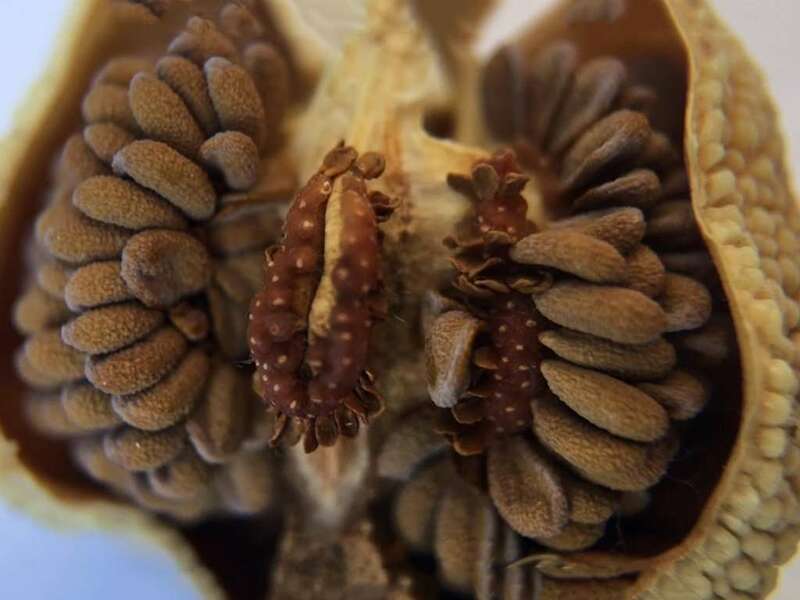 In nature, this allows falling seeds to avoid getting caught in the umbrella style when they’re released.Around September or October, seedpods will ripen, turn brown, and start to crack open releasing up to several hundred seeds. The seeds themselves are brown and the size of a pinhead. Collect the seeds, store in a plastic bag or envelope (remember to label your seeds so you know what the parents were!) and place in the refrigerator until you’re ready to germinate. 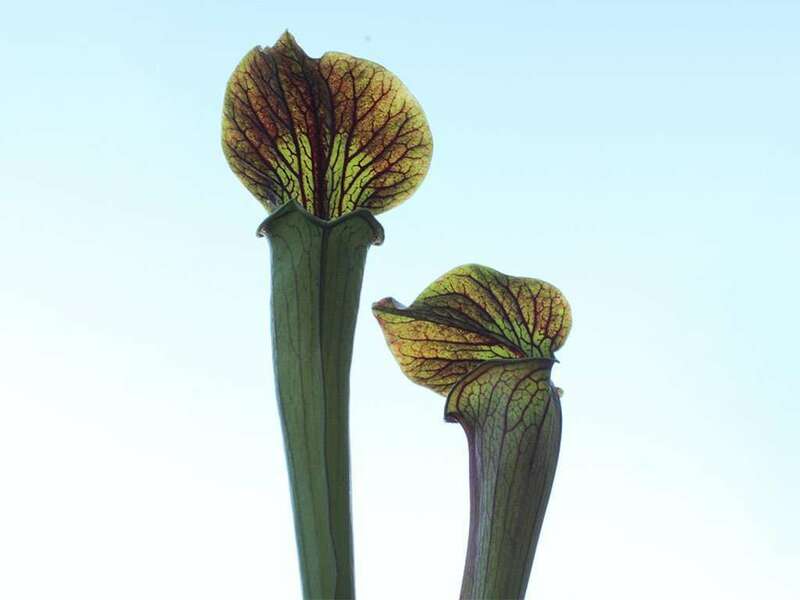 The history of North American pitcher plants is a piecemeal one, occurring over centuries of exploration and discoveries. -Hard to believe considering how common, yet unusual the plants used to be. Early European settlers first documented the Floridian Sarracenia minor in 1576. Tournefort described S. purpurea many years later, in 1700, from plants sent to him by Dr. M. S. Sarrazin of Quebec. 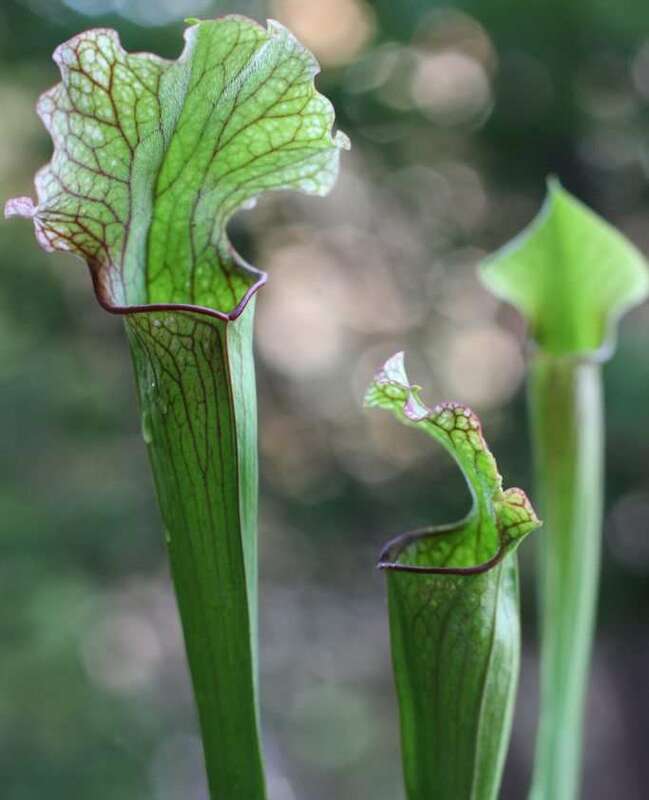 In 1731, Linnaeus finally named the genus Sarracenia and in 1793, William Bartram noted the insect-trapping nature of the pitchers while doubting that the plants benefited from this behavior. Darwin suspected this behavior to be carnivorous in nature, but never studied Sarracenia in detail. 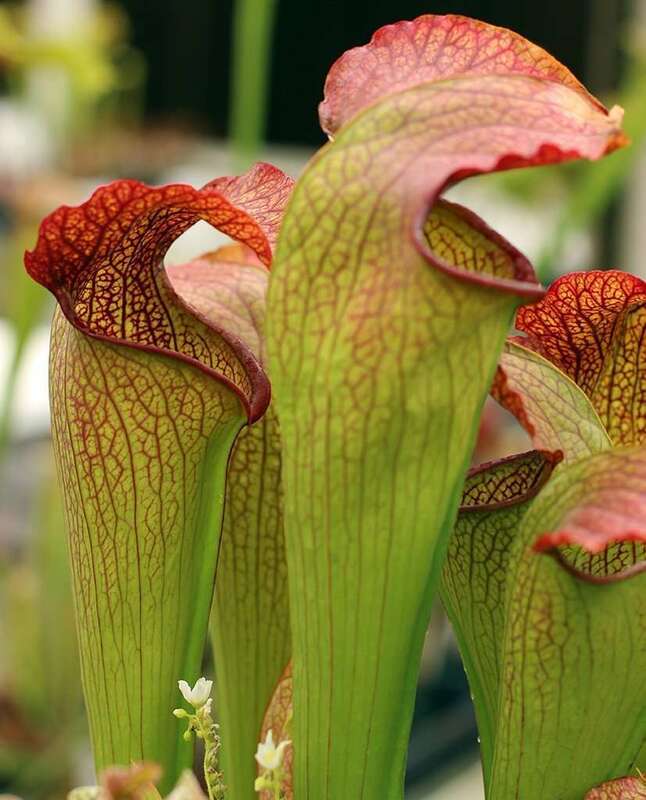 It wasn’t until the 1870s and 1880s that Dr. Joseph J. Mellichamp concluded that pitcher plants eat insects. Dr. Edgar Wherry conducted more studies in the 1930s and broadened our overall understanding of the plants. More recently, Frederick Case and Dr. Donald Schnell studied the plants, and set modern standards for species and subspecies classification of the genus. North American pitcher plants used to be native to most of the southeastern coastal plains of North America. Unfortunately, due to man-made developments, drainage of wetlands, and the suppression of naturally occurring fires that clear brush, many pitcher plants are endangered – some like S. oreophila critically so. Illegal poaching is still an issue, so do your part to preserve these amazing plants by purchasing from reputable retailers. Below you’ll find a map of locations where the plants are still found in the wild. 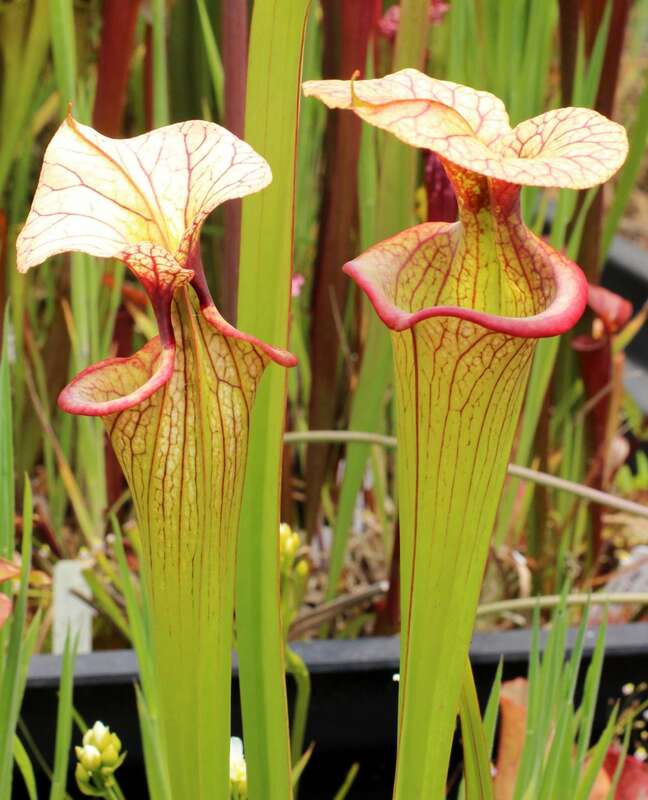 North American pitcher plants happily grow in a mix of 70% sphagnum peat moss to 30% horticultural sand . Alternatively, give a 80% peat , 20% perlite mix a try. Avoid higher levels of perlite as it’s slightly alkaline, and Sarracenia prefer a more acidic mix. Sphagnum peat moss, horticultural sand, and perlite can be easily purchased online via the provided links, or found at garden supply stores and The Home Depot. Avoid regular potting soil as it will burn the root system and kill the plant. Four or five inch, drained plastic pots or glazed ceramics are ideal for a single immature plant. Mature plants do best in 2+ gallon pots with a diameter of around 8 inches . Remember, Sarracenia produce new growth points off of their rhizome, so they’ll fill in even these larger pots. You’ll want to divide and transplant mature plants every few years to keep them happy and your collection growing! Set pots in water saucers to maintain soil moisture. Use distilled or reverse osmosis water. This can be inexpensively purchased in most grocery stores, or you can invest in a reverse osmosis (RO) filtration system that hooks up to a sink (bonus – this also provides great drinking water for humans and pets). Keep the plant in a water tray and fill this tray to maintain damp-to-wet soil year round. Sarracenia enjoy full-to-part sun. Brighter conditions will promote red coloration in the pitchers, genotype-permitting. I’ve grow them with great success in direct, sunny Southern California light. 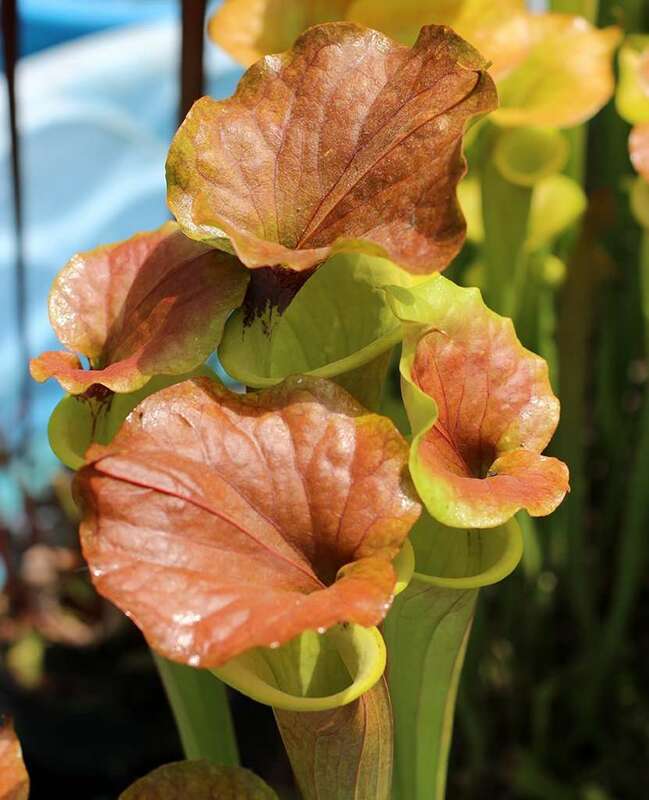 Outdoor pitcher plants will wreak havoc on the local insect populations, devouring flies, ants, beetles, wasps (so. many. wasps. ), and moths. Indoor plants will need your tender care, and enjoy hand-feedings of just about any bug that reasonably fits in a trap – like crickets or sow bugs. If feeding live insects isn’t your thing, you can use dried insects that can be purchased at these links or found at pet food stores (lizard food). Remember, these plants grow naturally in nutrient poor soils – a major reason why they evolved traps to catch insects as their source of nutrients. Outdoor plants that ravage local insect populations definitely don’t require fertilization. Greenhouse growers with less prey to rely on, can use a diluted orchid fertilizer for foliar-feeding (applying it only to the pitchers of the plant) once or twice a month. 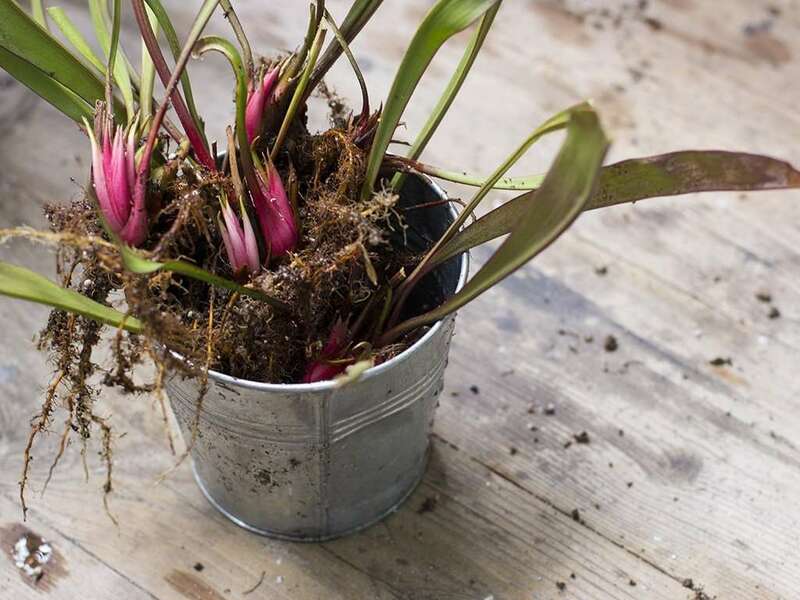 This can also be a great way to grow baby pitcher plants into mature plants in as little as three or four years. Transplant in later winter, during but towards the end of dormancy. Divisions and transplanting into fresh soil every three to five years will promote healthy growth and keep plants from overcrowding pots. I’ve written a step-by-step Sarracenia division and transplantation guide on this topic to help you. Cut back any flower stalks that arise after transplantation and plants will recover faster. 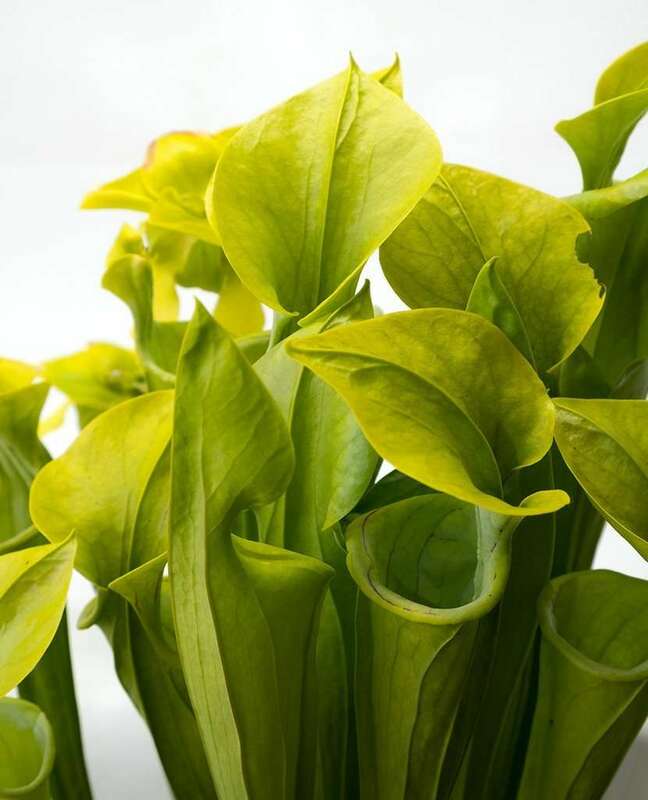 Sarracenia will produce offshoots and new plants with age. Divide and transplant into fresh soil every three to five years to promote healthy growth and increase your collection. I’ve written a step-by-step Sarracenia division and transplantation guide on this topic to help you. Cut back any flower stalks that arise after transplantation and plants will recover faster. Sarracenia leaf pulling propagation has mixed results, and simple divisions are much more effective. Either way, feel free to experiment, give the technique a try and let us know if it was successful for you.Identify a newly-developing pitcher months before winter dormancy. 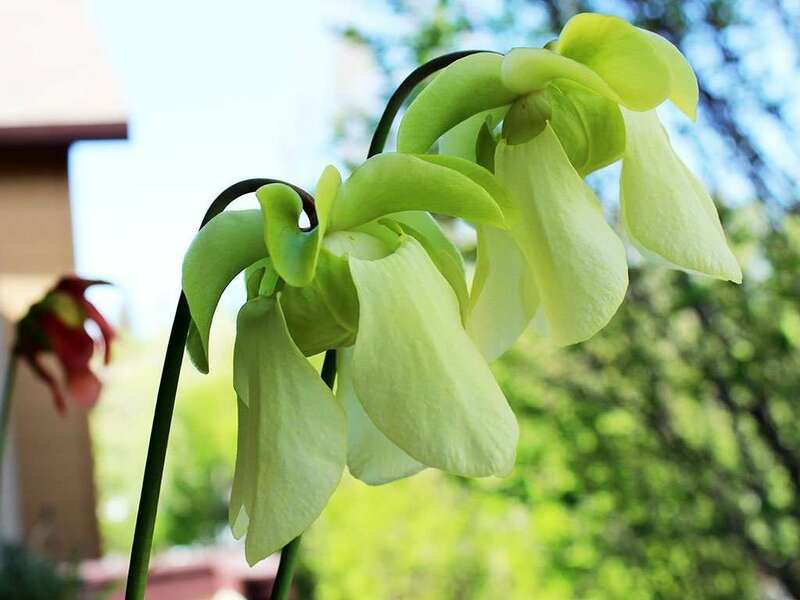 Remove this pitcher by pulling it off with the triangular whitish base that connects it to the main rhizome. Place this pulling in soil so that the pitcher remains upright, keep humidity high, light ample, and wait a 3-4 months. 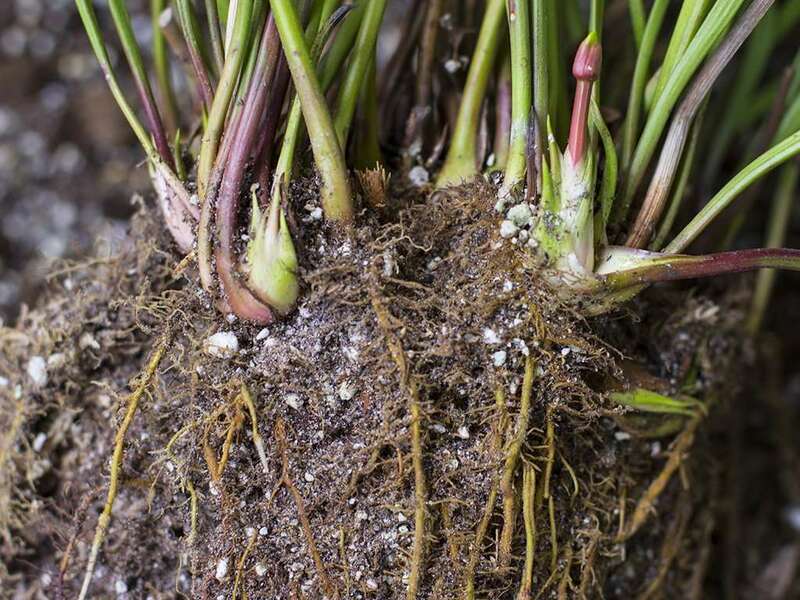 Roots will start to form from the whitish rhizome and, if you’re lucky, you may get a growth point from which new pitchers will develop. To germinate pitcher plant seeds, sow sparsely onto the surface of your preferred soil mix during February and stratify for 4-5 weeks with chilly, damp weather. Be ready with a fungicide should you encounter damp-off or botrytis.When weather turns around in spring, seeds will germinate creating wee-tiny pitchers. By the end of the first growing season, they will be 1-2 inches tall. You should have mature plants in about five years, or use a foliar fertilizing technique to shave that down to three to four years. 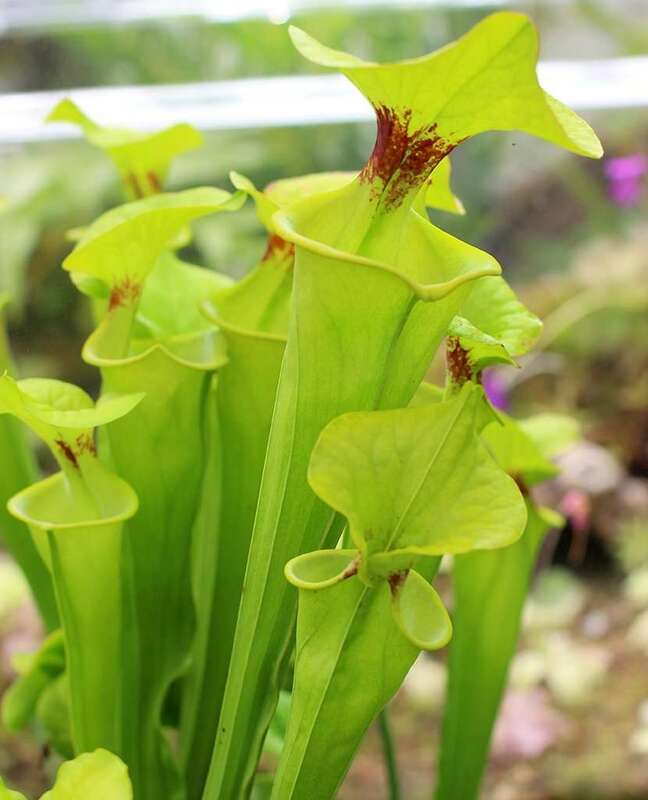 Sarracenia can be propagated in tissue culture via sterilized seed. 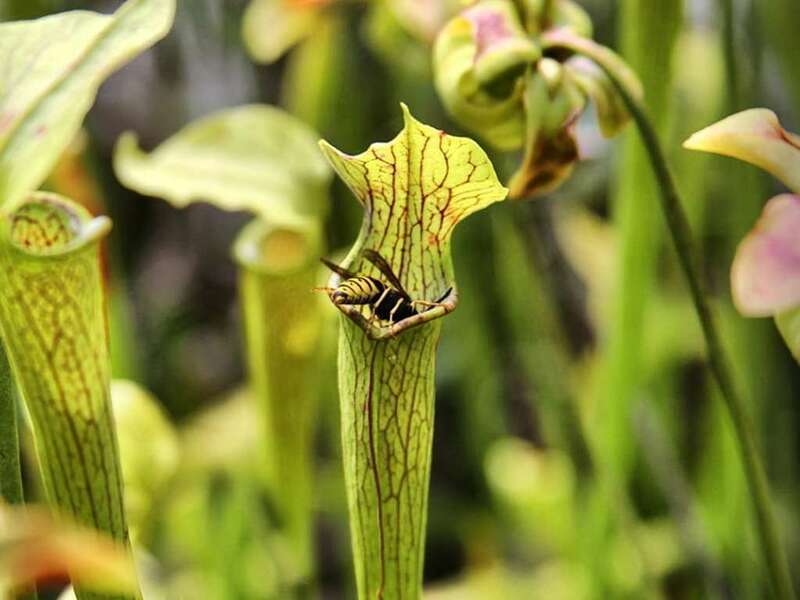 While it is my belief that Sarracenia will usher in the bug apocalypse, there are insects seemingly immune to their ravenous behavior – we refer to these as pests. Thrips (curse them! ), mealybug, scale, and aphids will damage pitcher plants. Insecticides help. I try to use systemic insecticides that punish pests months after application, but sometimes you’ll need to repeatedly apply for complete eradication.If leaves are damaged prior to fully developing, as is the case in aphid attacks, remove them so that the plant can focus energy on developing new pitchers that will be more capable of catching prey.Damp-off fungus can attack seedlings, especially during stratification, so keep a fungicide handy. They are warm-temperate plants enjoying warm-to-hot summers and cold winters. Light frost and brief freezes are common. Avoid cooking root systems in pots that overheat during very hot summers. Pitcher plants thrive in temperate, warm-temperate, and Mediterranean-like climates. I’ve successfully grown them outdoors in both Southern and Northern California. They do well in cold houses, cool houses, and warm houses, and in cold frames in warm-temperate climates. The extra humidity provided by a greenhouse is enjoyed by the plants. Not impossible, but most pitcher plants grow fairly large and all require winter dormancy, so don’t make great terrarium candidates. Will thrive in very sunny windowsills. Added bonus – pitcher plants eat those pesky house flies that hover near windows when trapped indoors. Keep the plants cooler during winter dormancy. 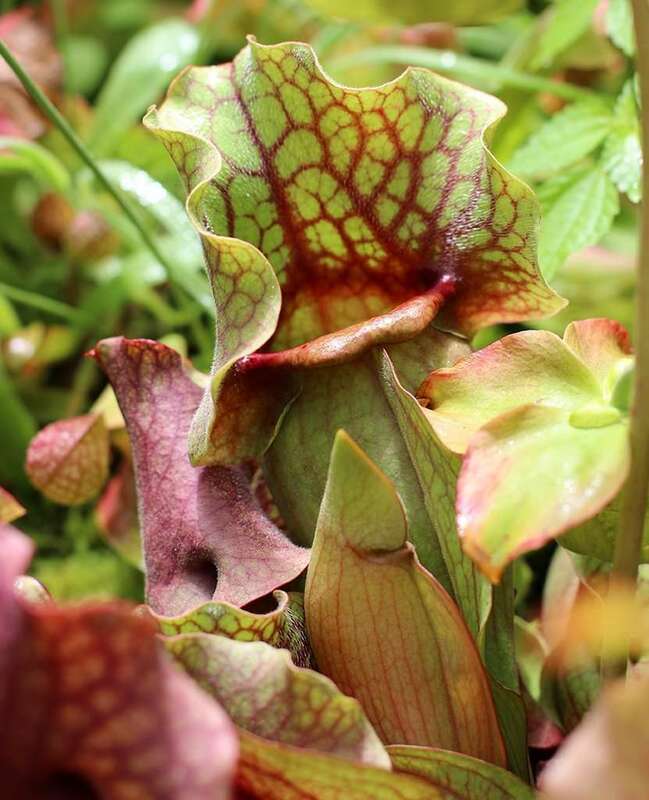 Some of the best candidates for bog gardens, Sarracenia do well in temperate, warm-temperate, and Mediterranean-like climates. Mulch in colder areas to prevent long freezes.